Acting as anticristallizers, LYCASIN® maltitol syrups imitate the various functionalities of glucose syrups in sugar-free confectionery. They have both a limited sorbitol content to reduce the hygroscopicity of finished products, and a high maltitol content to achieve the required sweetness. LYCASIN® is non-cariogenic. LYCASIN® HBC is a maltitol syrup specifically designed for premium sugar-free hard-boiled candies. Easy to process with existing equipment, it offers better stability of the candies and optimum process conditions. 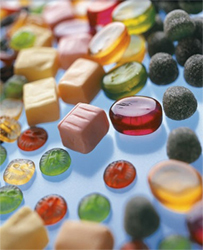 LYCASIN® HBC and LYCASIN® 80/55 are also used to produce sugar-free gum, chewy sweets, fudges and toffees.